What is a Bunky Box? If you follow along with us on Instagram or Facebook, you likely have seen glimpses of gift bundles described as our one-of-a-kind Bunky Boxes. A Bunky Box is a specially curated, wonderfully unique assortment of goodies picked specifically for the recipient- whether that is a friend, co-worker, lover, or yourself! 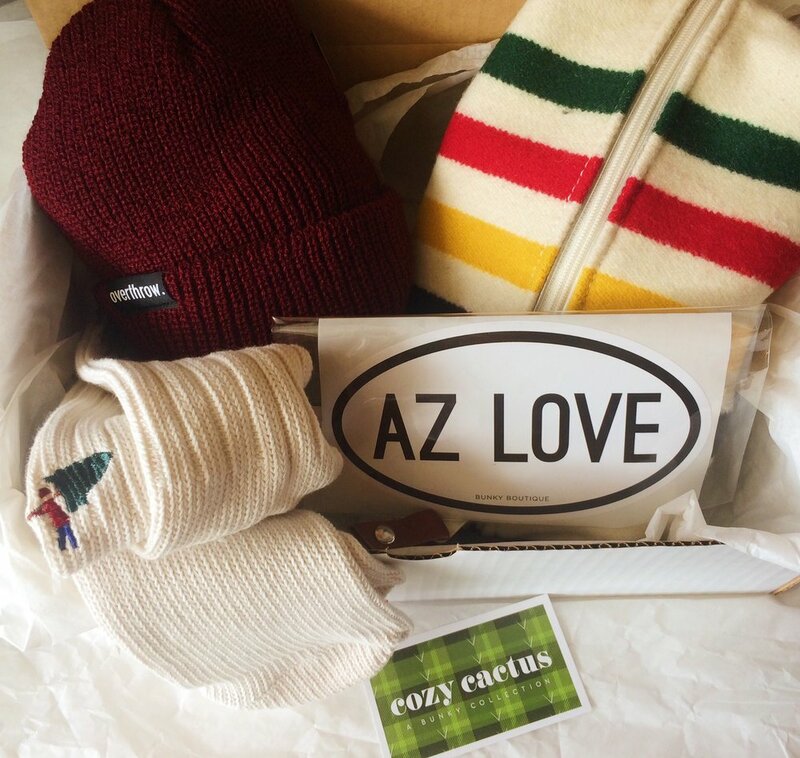 We have always been experts at helping our customers find the perfect gift from our Downtown Phoenix outpost, but then we thought, "How great would it be if we could make the gifting process even easier?" Your Bunky Box can be tailored to fit any occasion, whether it be a baby shower, birthday, housewarming, or a simple "thinking of you" gift. We request that you complete a simple questionnaire so that we can get it just right! Have a long to-do list? Let us assemble Bunky Boxes for your upcoming conference, retreat, or welcome party. By (1) selecting your price and (2) completing our brief questionnaire, you will have successfully gifted the perfect present! Really, it's that simple. Bunky Boxes start at $50 and can be shipped anywhere in the United States. 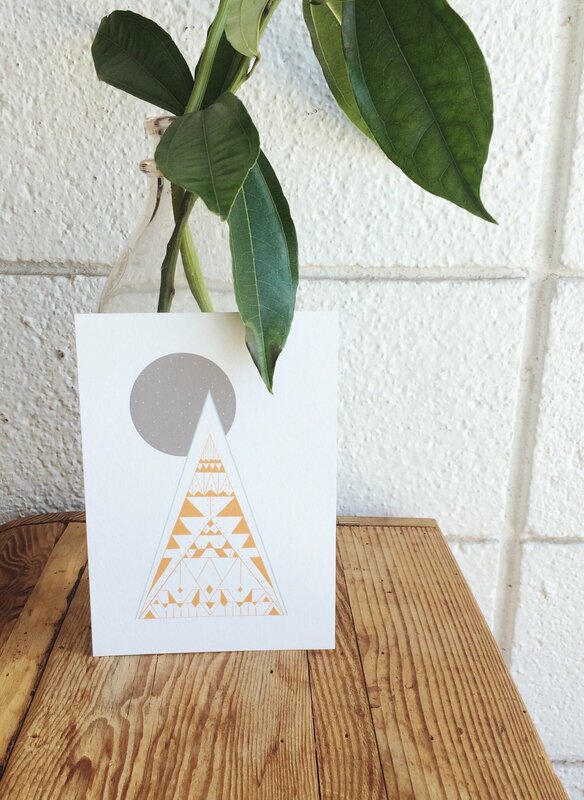 If you would like us to write a message on your behalf, we will include a complimentary greeting card. Father's Day is June 17th! The countdown is on; Father's Day is Sunday, June 17th. Let dad know he's the real MVP with a cool new trinket, unique gadget, or fresh summer outfit. All items listed are available from our online shop and.or our downtown Phoenix flagship. Let us know your order is a gift at checkout, and we will take care of the gift wrapping for you! We are stocked with lightweight summer button ups, crisp tees and shorts in a variety of lengths and colors. Treat Dad to a fresh outfit; if he is anything like my dad, he will appreciate getting to skip the shopping! Our in-house collection of tees and accessories for men are always a safe go-to. 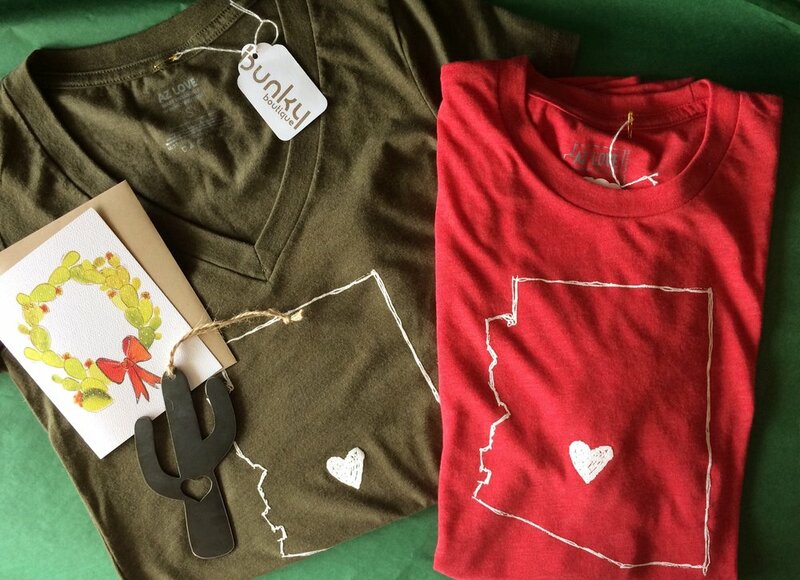 Choose from Bunky-exclusive PHX items, or the beloved Arizona Love collection. Must be worn with pride! Gadgets, accessories, and small treasures Dad will get a kick out of. So dopp! Pendleton wool dopp bags make a handsome + useful gift. Fill one with skincare favorites. It's fun to receive gifts that you wouldn't normally splurge on yourself. This time of year the sun is especially harsh on our skin, so get dad some solid products he will be excited to reach for each day. Muscle Joint Salve Stick to soothe sore muscles, aches, and bruises after a long day at work or at the gym. Palo Santo Hand Salve for cracked, dry skin. Green Tea Serum helps repair weathered-damage skin, relieve razor burn, and gives your face a healthy dose of antioxidants and essential fatty acids. Ever get a little too much sun? Yeah, us too, often! Sun Worshipper helps rapidly heal sun burns and prevent peeling. Email us at hello@bunkyboutique.com for more info. and to order. Sweet on YOU. Valentine's Gift Guide 2018! Whew, January really felt like it was here forever, didn't it?! February is here and visions of conversation hearts and chocolates immediately come to mind. Whether you are all-in for the day devoted to lovers, plan on celebrating Galentine's Day style, or simply like a excuse to give your sweetie somethin', we have just the thing! Gift jewelry sets that are uniquely timeless and totally her. Our incredibly talented local artisans stock us with unique jewelry ranging from every day staples to eye-catching conversation pieces. Find even more in store! Supplement the usual sock-and-underwear restock gift with some useful and out of the box gift ideas for men. Though, we do have some pretty great socks. Useful + handsome bead bracelets and stamped tie clips make great gifts for your guy. Let your best amigas know they are VIP's! Holiday Gift Guide, 2017 Edition! The holidays are here! We are arming you with this handy cheat sheet to inspire your shopping plans, and help cross names off your list! Remember! Your online orders ship free within the U.S. when you spend $75 or more! Sometimes it is the small gifts that are the most cherished. We have an excellent skincare lineup for men and women; perfect for slidin' into stockings. Pair the Coconut Green Tea Facial Steam with a nourishing + organic mask and the new fan brush applicator for an at-home facial gift set. Gift the Muscle Joint Salve Stick ($14) for peeps with aches, pains, or that hit the gym often. It's like an all natural icy hot (that smells fantastic). Quirky, unique, and all $15 or less. Gift exchanges can be hard, we make it easy. P.S., these also make great stocking stuffers! Our exclusive Arizona Love line has something for everyone! Men's tees, women's tops, baby onesies and bibs, and goods for the home. Only available at Bunky Boutique! Have you visited our Homegoods shop page? Most of the great products there are priced at a nice $25 or less! Use this resource for when you need to buy for peeps in bulk (i.e. coworkers, a friend group, teachers, etc.! ), or need to assemble a gift basket. Great for all ages, and makes an interesting coffee table display! Choose from an Arizona or Cactus shape and give a little desert love! I find that one of my small pleasures is a fresh and fun tea towel greeting me in the kitchen. I know, this sounds silly (but you know you agree!) Mix and match from our varied selection, and make someones kitchen happy! These hand crafted ornaments deserve a sturdy brand, front and center! Gift one to everyone on your list- they will be cherished year after year. Don't be caught empty handed when a neighbor drops off fresh Christmas cookies! Gift them a thoughtful & festive goodie. Seasonal, locally-poured candles are always a win. Right now choose from fragrances like Pecan Pie, Mulled Cider, and Cranberry (our current favorite!). Bring a pitcher of vibrant Mulberry Rose punch or give them the supplies to make their own. exclusive to Bunky Boutique! Mix this beautiful, deep-red syrup with soda water, vodka, and garnish with sliced citrus and fresh cranberries. Pretty! House a festive poinsettia plant in these desert-themed cuties. They can be re-purposed for indoor plants, organizing office supplies, children's toys, or holding holiday wrapping paper! Available in Small ($16) and Large ($22) sizes. Treat that chica who knows you best to a cozy winter sweater you know she will love, an extra-special piece of jewelry with a secret message, or supplies for a night in. Choose from "BFF," "SISTER," and more phrases, in either gold or silver chain. Or, order a custom phrase! One of the best parts of winter are versatile and ultra comfortable sweaters, ponchos and cardigans to bundle up in. Shop our selection of classic knits that look and feel incredible. Shop a variety of beauty products, moisturizing face masks and healing serums perfect for gifting. We are proud to carry organic skincare options from Urb Apothecary. A "quick, dirty, and direct" tarot card deck not for the faint of heart. A quirky gift that doubles as a great ice breaker and will provide ample entertainment during weekend cabin trips. Make him the most interesting man on Christmas day with an assortment of unique socks he will love showing off. Another item he will cherish for years, but likely never purchase for himself. Dopp bags keep his toiletries neat and at-the-ready for travel. He will be stoked about the recycled Pendleton wool exterior. A long time favorite of our male customers, the Baxter skincare line includes everything from sturdy, handsome combs to an array of hair pomades, moisturizer, and the best shaving cream. Fill a dopp bag with a couple items and he'll be entering 2018 a fresher man. With a throwback vibes, our "Go Fish" and "Mountain Animals" playing card decks will take him back to the days of summer camp. His dorm mates will be impressed. Let us help! Whether you are in a pinch and short on shopping time, not quite sure what to get, or want to gift yourself (yay! ), a Bunky Box is always a safe bet. Starting at $50, each Bunky Box is carefully curated to delight and surprise your recipient. After completing our brief survey, we begin building the perfect gift box. Springtime in Arizona is bustling with activities and events, gorgeous weather, and visiting friends + family. Will you be opening your home to visitors this season? Maybe you are hosting relatives or renting your space to seasonal snowbirds through Airbnb. A sweet southwestern welcome basket or tasteful decor is a wonderful way to welcome your guests. Instantly freshen up a room with unique wall art, without spending a fortune. Art prints are available in an array of standard frame sizes, so hanging is a breeze! We offer some styles in simple monochrome color ways which easily compliment any decor. Let your guests explore the city at their leisure. Our exclusive guide to Downtown Phoenix marks all the best places to shop, eat, grab coffee, cocktails, or catch a show from Downtown to Uptown Phoenix. Leave a guide out for your guests and take the guesswork out of finding unique, independent hangout spots and entertainment. Pick up a guide from Bunky Boutique, or email info@bunkyboutique.com to order in bulk. Don't let excessive rays ruin a trip! Provide your guests will plenty of water, sunscreen and our go-to skincare for pre- and post-sunshine, Sun Worshipper Repair Serum ($26). This powerful tonic leaves skin rejuvenated and heals the harsh effects of soaking up the sunshine all day. Leave little Arizona-inspired goodies for your guests to tote around town and remember their stay. Shown here: Linen Pouch ($25), Flowering Cactus Pin ($12), Saguaro Keychain ($5). Rested guests are happy guests, so create a comfortable space with these simple additions. Leave a tray of soothing teas and honey sticks with an electric kettle for tea time. Our AZ Love mason jars are the perfect all-purpose tumbler ($6). Palo Santo bundles provide a flameless aromatic experience in addition to being visually pleasing ($12), and the Slumber roll-on serum ($22) is a thoughtful gift that is sure to be appreciated. "Slumber Serum is full of herbs and essential oils that help calm racing minds, soothe anxiety, and ease one into a deep and peaceful slumber." Adorn an accent pillow with the Succulents Pillow Case for southwestern flare. Silk screened with eco friendly ink on all natural cotton canvas, measuring 20" x 20" ($48). Pick up finishing touches for your space such as southwestern coaster sets ($24), Succulent Trivets (which double as plant stands! $22), and notebooks + sketch pads for impromptu jotting, doodling, and inspiration ($7-$16). Leave a welcome basket for your visitors such as a bundle of our unique homegoods (see below), or let us do the gifting for you! Purchase a Bunky Box, and we will specially curate a collection of goods for your guest. Bunky Boxes arrive wrapped and ready to give, and each one is unique! Starting at $30. We know how hectic life can become during the holidays; decorating, shopping, hosting get-togethers, attending celebrations, and the traffic! Cross one to-do off your list and let us do the gifting for you. Our exclusive Bunky Boxes are perfect for the holidays. Each specially curated bundle is packaged with care and filled with items we hand select specifically for you (or your recipient!). Your Bunky Box arrives wrapped and ready to gift. Simply add the Bunky Box to your cart, and fill out our short survey so we can select items we are sure you will love. If you are gifting a Bunky Box, fill out the questionnaire to match your recipients tastes. Bunky Boxes start at just $30 for a Goodie Bag, or a mini sampler that is just-right for gifting co-workers, secret Santas, or sending a little holiday cheer to neighbors! You may choose to have your Bunky Box shipped, or pick up in-store for no additional cost! Although summer is going strong here in the valley, we cannot deny gradual hints of the Fall season approaching! The days are growing shorter, the mornings are cooling (even if it is by only a couple degrees), and fantasies of crisp Fall air are stronger than ever! "Lets Build an A-Frame and Live in the Woods"
All natural soy wax candle locally made in a recycled glass jar. Transport yourself to a cabin in the woods with this sultry whiskey scent! Email info@bunkyboutique.com for ordering. A romantic ode to the simple life. For adventure plans, sudden moment inspiration + doodles. BPA free and fits ever so nicely into your bicycle's water bottle cage and car cup holder.